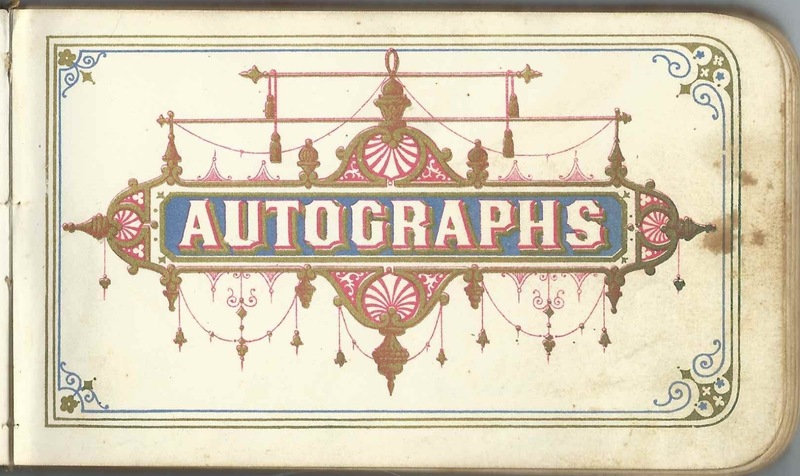 Autograph album given to Eveline Bement, "Eva" at Christmas in 1878. She kept the album through the 1880s. At some point, presumably after Eva's death, her daughter Helen Woodruff inscribed two pages. 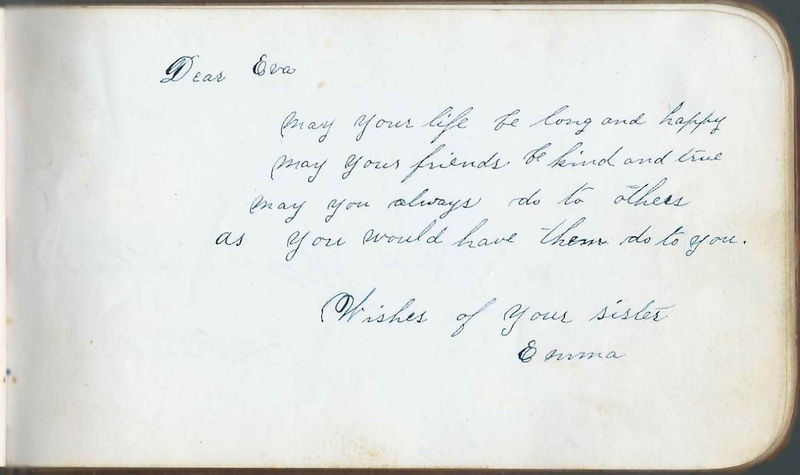 The album measures approximately 5-1/4" by 3-1/4" and contains the sentiments of nearly 70 of Eva's relatives and friends. An alphabetical list of the inscribers, together with any personal information they offered, appears at the end of this post. Cary Pasons or Parsons ? Eveline Bement, "Eva", was born in 1858 in Cambria, Michigan, the daughter of Oliver Bement and, possibly, Mariah (Murray) Bement. 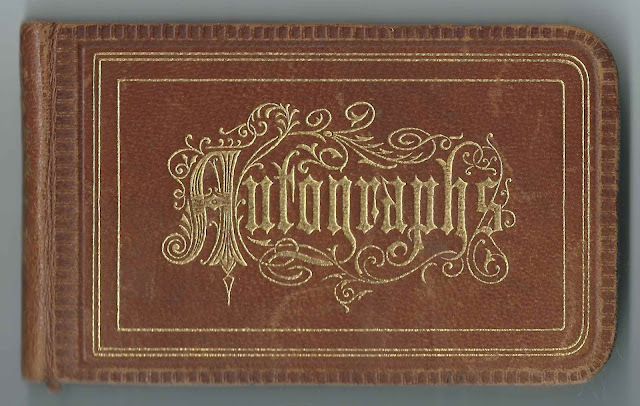 Eva's sister Emma Bement inscribed a page in the album. On September 23, 1888 at Osseo, Michigan, Eva married Frank Woodruff, son of Franklin Woodruff and Jane (Carpenter) Woodruff. Eva and Frank had a daughter Helen, born May 16, 1894; sadly, it appears that Eva died on that day. She's buried in the Maple Grove Cemetery in Hillsboro County, Michigan. At some point later, Eva's album apparently came to light, and daughter Helen inscribed two pages in it. Frank died in 1943 and is also buried in the Maple Grove Cemetery in Hillsdale County, Michigan. If you have corrections and/or additions to the information above, please leave a comment or contact me directly. Ellen Andrew; inscribed at Hillsdale, Michigan, on February 9, 1879. "Remember Our Class"
Eveline Bement, Eva; album owner of Hillsdale, Michigan. 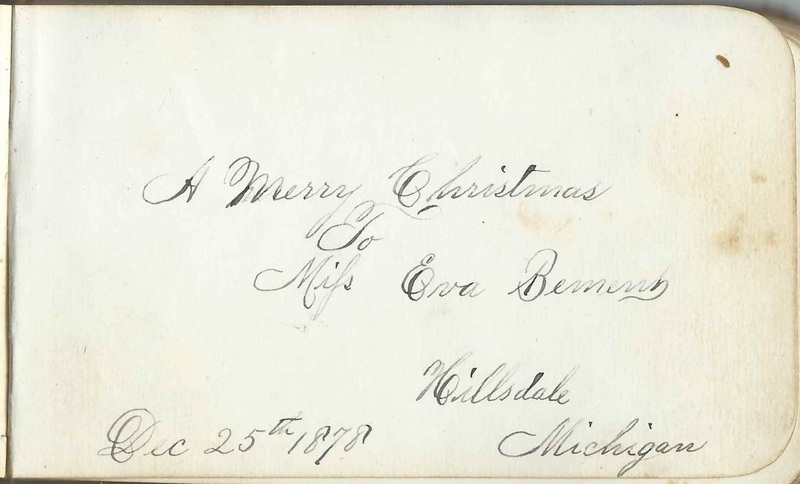 Eva was given the album at Christmas in 1878. Celia Brooke; inscribed at St. Louis, Michigan, on March 2, 1883. Eva's cousin. When you are away in Germany or France, remember the nights we went to the dance. Then of the oysters which were so seedy. But Mohr of the fellow whose name is "Reedy", and the dance at Mrs. Barnes, and the fellow who encircled you with his arms, This he managed by some construction without once having an introduction." "Is he a blacksmith?" Looks like "Clarence" in one corner and "?ncker" in another. M. B. Furman; inscribed at Hillsdale, Michigan, in July 1879. Presumably Maria (Blake) Furman, wife of Rev. Adoniram Judson Furman, and mother of Charles Blake Furman. Helen Woodruff of Hillsdale, Michigan. Eva's daughter.